Mr. Angel Gurría, Secretary-General of the OECD, was in Vienna on 7 November 2016 on an official visit to Austria. The Secretary-General held bilateral meetings with Mr. Christian Kern, Federal Chancellor, and several Austrian high-level officials. The Secretary-General and the Federal Chancellor held a press point at the end of their bilateral meeting. 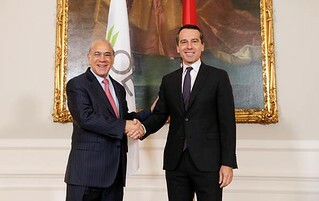 Vienna, Austria, 7 November 2016 - Angel Gurría, OECD Secretary-General (left) and Christian Kern, Federal Chancellor of Austria.